Today you will see some great projects using our November Ribbon Club Assortment from our very talented design team. They always come up with some super ideas. At the end of the hop, comment on this post answering the question below for a chance to win our November Ribbon Club assortment shown below. What is your favorite Christmas cookie and do you bake or buy? Welllll, I bake and BOY do I bake! I also have several favorites - please don't make me choose! I love good ol' chocolate chip cookies and then there is chocolate dipped pecan shortbread, snickerdoodles and don't forget chocolate covered peanuts. 'Tis the season to put on 10 pounds!! Our winner will be selected from the numbered comments on this post on Tuesdsay, 11/17. Be sure to check back on Tuesday evening to see if you are our lucky winner. I bake snowballs the cookies lol! Gingerbread men. I love them and everyone else loves them. It's one of the more difficult doughs to work with sometimes. It has to sit overnight or at least 8 hours. The molasses smells so good. Thank you for the beautiful blog hop. I'm kind of a plain girl so I love Snickerdoodles, and make them, but sometimes I just love those thick, cake like, frosted cookies from the grocery store bakery. You know......The ones with the thick, oh so good for you, colored frosting and sprinkles. I have old Christmas cookie recipes from my mom that I love to bake. It's hard to pick a favorite! We used to bake cookies together--frosted and decorated sugar cookies, chocolate chip, lemon crispies, oatmeal and raisin, and butterscotch chewies. But I think my favorite were the ones called crescents. They were a shortbread with nuts in the shape of a crescent and dusted with powdered sugar. Yum! my favorites cookies is gingerbread. and I bake them with my daughter. Snickerdoddles and my mother makes them for me. You got it with the choolate chip with Toll House morsels. I bake and can easily eat them all myself. I don't do as much baking as I'd like, but I do love gingerbread and pumpkin cookies this time of year. I used to bake a lot! So many different types of cookies and breads. But now that my kids are older I just pick a few favorites. Russian tea cakes, my grandmothers recipe, is my favorite. Chocolate chip is still my kids favorite. And I have discovered how easy it is to melt chocolate bark and dip pretzels or mix peanuts in it. Instant Christmas candy! I do all my own baking at Christmas. It changes from year to year, but I always love a soft, pillowy iced sugar cookie! I bake! My favorite, and one I make every year, would be Almond Bars! My greatgrandma's almond biscotti and peanut butter blossoms. And there are so man more. Every year I also try to bake a new cookie I have not tried before it's fun. I bake with my daughter and have since she was 4yrs old. She is now 24yrs old. I love or time together! 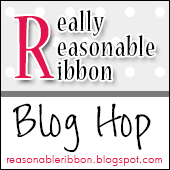 Thanks for the blog hop, great inspiration with such lovely ribbons.